The most significant recent trend in cosmetics and personal care has seen widespread demand for multibenefit products: consumers have raised the bar in terms of product expectations while at the same time finding that their hectic lifestyles leave them less time to invest in their care routine. This has led to the creation of new, advanced products that deliver excellent results with minimal demands on consumers’ time. 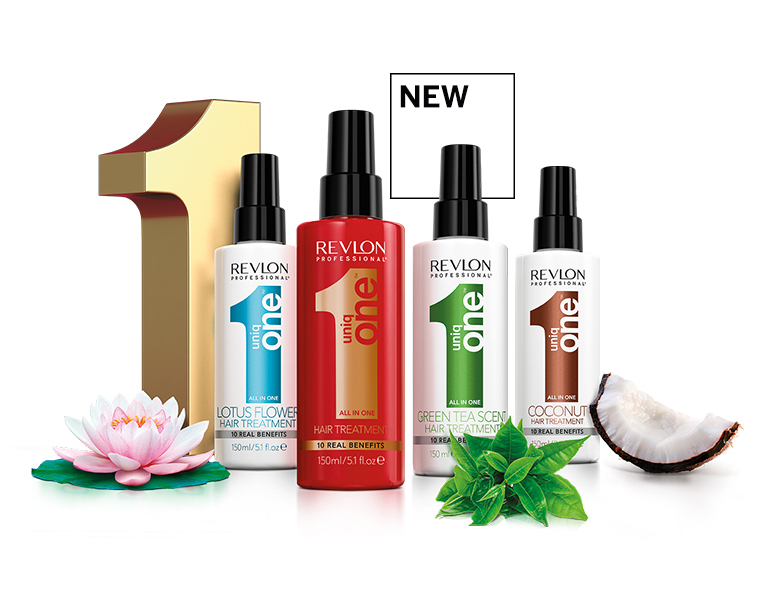 However busy they are, women want to feel great about their appearance every day, and in response to this, Revlon Professional® developed UniqOne™, the leave-in multibenefit spray mask that guarantees professional results and can be used on wet or dry hair. This pioneering approach to hair care in a daily treatment spray has consistently won awards in the cosmetics and haircare sector thanks to its ability to deliver silky, shiny, soft hair that is well protected and manageable without any added weight. Our commitment to constant innovation and improvement has inspired us to further enhance this unique formula with a selection of four evocative fragrances. In addition to the exclusive Classic, Coconut and Lotus Flower fragrances, Revlon Professional® perfumists have now developed a captivating new scent that embraces the aromatic, citrus freshness of green tea, and softens it with delicate, musky notes, allowing women to indulge in an exquisite haircare experience that will leave their hair looking and feeling spectacular every day. The UniqOne™ brand has continued to revolutionize homes and salons all over the world with its advanced technology that provides 10 real hair benefits in formulas that deliver professional results. Following the spectacular launch of UniqOne™ Hair Treatment, our flagship all-in-one hair beauty treatment, the range has been extended to include UniqOne™ Conditioning Shampoo, Super10r Hair Mask and a Dry Shampoo. Every one of these innovative hair beauty formulas has a pleasant texture and exquisite fragrance, delivering the multibenefit care you need for silky, shiny, manageable hair every day. Learn how to achieve spectacular results with the exquisite fragrance of your choice and discover the secret to looking and feeling great every day. Visit your salon and ask your hairdresser for more information about our unique multibenefit approach to haircare.